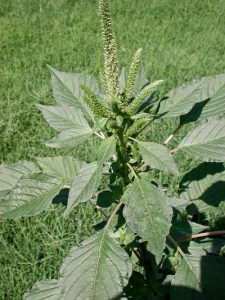 USDA has learned that Palmer amaranth (Amaranthus palmeri), an invasive weed, may have infested some newly-seeded (2016) conservation plantings across the upper Midwest. Palmer amaranth is highly competitive, and in fact, is the most competitive of the pigweed species. It grows rapidly and one plant can produce a quarter-million seeds. We are concerned that this weed may cause conservation planting stand failure and spread from conservation plantings into crop fields. 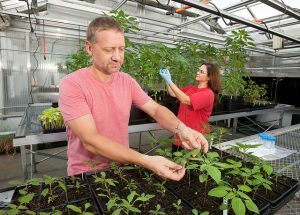 It can greatly inhibit crop growth. Yield losses have been reported at up to 91 percent for corn and 79 percent for soybeans. It can also be toxic to livestock because there is nitrate in the leaves. State Department of Agriculture, and extension specialists in your area. If you are considering a conservation planting this spring, consider testing your seed for “all states noxious weed seeds.” Monitor your planting throughout the growing season. Also, the Farm Service Agency and Natural Resources Conservation Service are ready and willing to help you with ongoing conservation planning efforts for your operation. Feel free to reach out to our field staff at any time. Remember, the presence of Palmer amaranth does not necessarily constitute a stand failure. Working together, we can control or even eradicate this weed and help ensure that your conservation planting is performing to its full potential, and that crop fields are protected.